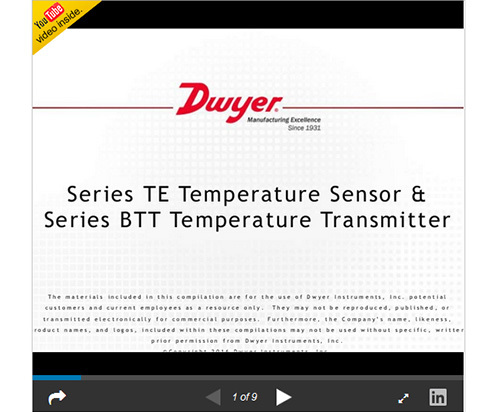 The SERIES TE Duct and Immersion Temperature Sensor can be used to monitor air or water temperature throughout a building management system or an air handler unit. 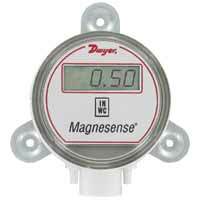 Flanged duct sensors monitor the supply or return air and provide a thermistor or RTD output to the digital controller. 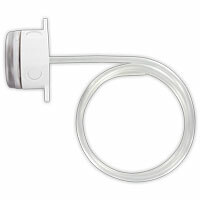 Immersion sensors which are supplied with compression fittings are typically used to monitor the hot or chilled water lines throughout a building. Thermowells are recommended, but not required on the immersion sensors. For variable air volume applications, the Series TE can be configured to have 8' plenum rated cable with flying leads. Standard units come with 4" leads with an integral terminal block to eliminate carrying extra wire nuts. 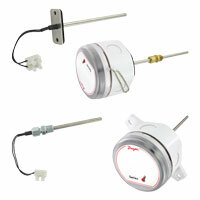 For housing models, multiple knockouts provide easy conduit access to any side of the housing. 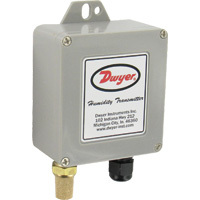 The 1/4 turn lid comes with a chain to prevent it from being lost during installation. Thermistor temperature sensor: ±0.22°C @ 25°C (±0.4°F @ 77°F); RTD temperature sensor DIN Class A: ±0.15°C @ 0°C (±0.28°F @ 32°F). Plenum option includes UL listed plenum cable. Meets UL, 94 V-O polycarbonate plastic. NEMA 4X (IP66) (DFW, IBW only). EXAMPLE TE IBN A 04 4 4 12 Series TE-IBN-A0444-12 Immersion Probe, 10K type 3 thermistor, 4" probe length, 1/4" probe diameter, 4" flying leads, with 1/2" NPT connection.